Binghamton Residents! 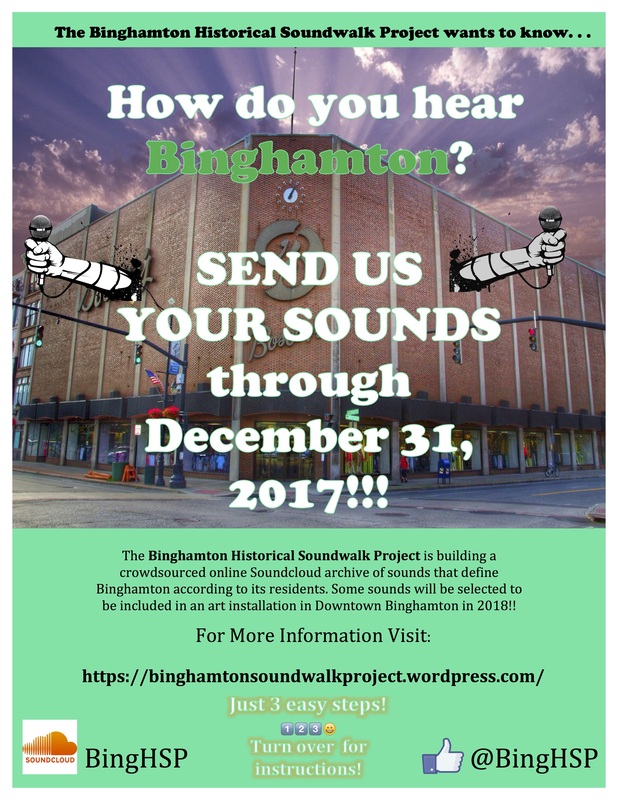 The Binghamton Historical Soundwalk Project is conducting a “sound drive” through December 31, 2017! We want to hear what sounds you consider essential to life in the city, particularly your experiences and memories of sound along Water Street, Court Street, and the River Walk! 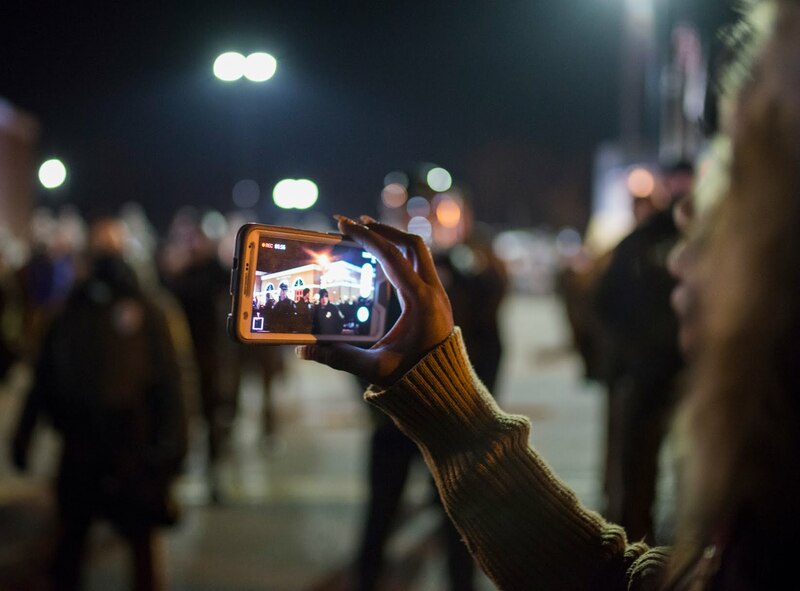 Make short recordings (<2 minutes) via your cell phone or other recording device and send them to BingHSP@gmail.com with a short note about the date, time, place, and significance of your recording (scroll down for contribution guidance and suggestions). Your contributions will be uploaded to an online archive of sounds contributed by Binghamton residents that you can access and listen to anytime via soundcloud, and some of them will be selected as part of the live soundart project, The Binghamton Historical Soundwalk that will launch in 2018! Make a new recording of a sound that is significant to you along the proposed soundwalk route using your cell phone or other audio recording device (no more than 30 seconds to 1 minute in length). We’re looking for ambient sounds–sounds that create an atmosphere and sense of space–signal sounds–sounds that make you pay attention–NOISES–sounds that you consider annoying, distasteful, loud etc.–dominant sounds–sounds that take over a certain place–biophony and nature sounds–and soundmarks--Binghamton’s most distinctive sounds–and just overall significant sounds that are important to you and that you want others to listen to. We want it all! The good, the bad, the ugly, the boring. . .send it in! 2. Make a new recording of yourself sharing a memory of a significant sound from the proposed soundwalk route and tell us what it meant to you (no more than 2-3 minutes). I want to enable my students to mobilize sound studies not just as an analytic filter to help them understand the world, but as a method enabling more meaningful engagement with it. This post, an abbreviated version of the paper I recently gave at the Invisible Places, Sounding Cities Conference in Viseu, Portugal on July 18, 2014, explores my pedagogical efforts to move my sound studies work from theory to methodology to praxis in the classroom and in my larger community. In particular, I am working to intervene in the production of social difference via listening and the process by which differential listening practices create fractured and/or parallel experiences of allegedly shared urban spaces. Inspired by ongoing efforts such as ReBold Binghamton–the visual arts group alluded to by my assignment’s title– Blueprint Binghamton, and the Binghamton Neighborhood Project, I wanted to articulate sound studies methods with long-term community engagement interventions. I decided to task the upper-level undergraduate students in my Spring 2014 “How We Listen” course with designing community engagement projects that identified and addressed an issue in Binghamton, the de-industrialized town in upstate New York housing our university. My students’ proposals ranged from rain-activated sound art, to historical sound walks that layered archival sounds with current perceptions, and a “noise month” sound-collection and remix project designed to challenge entrenched attitudes. They then presented the projects via a public poster session open to faculty members, administrators, community representatives, and peers. Working with local residents and using asset-based theories of civic engagement, the students’ projects sought to re-sound Binghamton, enhancing existing forms of communication, amplifying hidden sounds and histories, and creating new sounds to resound throughout Binghamton’s future. While the students initially set out to “fix” Binghamton—bringing year-round residents into the world as their largely 18-21 selves heard it—the majority opened their ears to alternative understandings that left them questioning the exclusivity of their own listening practices. Students realized that while they may have been inhabiting Binghamton for the past few years, they hadn’t been perceptually living in the same town as year-round residents, and, conversely, that the locals’ tendencies to hear students as privileged nuisances had historical and structural roots. The historical, theoretical, and methodological groundwork that scholars of sound have laid in recent decades toward heightened social and political understandings of sound—fantastic in volume, quality, AND reach—have equipped sound studies scholars with powerful critical tools with which to build a more directly, civically engaged sound studies, one as much interested in intervention and prevention as continued reclamation and recovery. Scholar-artists such as Linda O’Keeffe have begun to fuse audio artistic praxis with the more social science-oriented field of urban studies. O’Keeffe’s community project, highlighted in “(Sound)Walking Through Smithfield Square in Dublin,” set out to solve an audio- spatial problem at the very heart of the city: why did the city’s efforts to “rehabilitate” the landmark Smithfield Square—which had been a public market for hundreds of years—bring about its demise as a thriving public space rather than its rejuvenation? Equipping local students with recorders, O’Keeffe documented the students’ understanding of the space as “silent,” even though it was far from absent of sound. She noted local teenagers felt repelled by the newly wide-open square; the reverberation of their sounds as they grouped together to chat made them feel uncomfortable and surveilled—so it remained an isolating space of egress rather than a gathering place. Importantly, O’Keeffe’s conclusion moved beyond self-awareness to political praxis; she presented her students’ self-documentation to Dublin city planners, intervening in Smithfield’s projected future and attempting to prevent similar destruction of other thriving city soundscapes unaligned with middle-class sensory orientations. O’Keeffe’s work sparked me to think of listening’s potential as advocacy and agency, as well as the increasing importance of reaching beyond the identification of diverse listening habits toward teaching people to understand the partiality and specificity of their sonic experience in combination with the impact listening—and the power dynamics it is enmeshed in—has on the lives, moods, and experiences of themselves and others. Listening habits, assumptions, and interpretations do not just shape individual thoughts and feelings, but also one’s spatial experience and sense of belonging to (or exclusion from) larger communities, both actual and imagined. Learning to understand one’s auditory experience and communicate it in relation to other people enables new forms of civic engagement that challenge oppression at the micro-level of the senses and seeks equitable experiences of shared space to counter the isolating exclusion compelled by many urban soundscapes. O’Keeffe’s project also made me rethink how space-sound is shaped through social issues such as class inequity, particularly in my community of Binghamton, a small town of approximately 54,000 currently facing profound economic challenges. The end of the Cold War devastated Binghamton’s economy—then primarily based in defense—and the economic downturn of the early-1990s provided a knock-out punch, severely impacting the region in ways it has yet to recover from: the behemoth local IBM relocated to North Carolina, manufacturing jobs permanently decreased by 64%, and the population shrank almost by half. Recent climate-change induced disasters have also left their mark; massive floods in 2005 and 2011—on a geographic footprint historically flooding only 200-500 years—displaced thousands of low-income residents, destroyed many businesses, and collectively caused 2 billion dollars in damage. The 2008 global recession left over 30% of Binghamton’s residents below the poverty line, including 40% of all children under 18. The campus, 12,000 undergraduate students strong, often seems remote from the city I just described. Only 6% of BU students are drawn from its surrouding Broome County. The vast majority (60%) of BU’s students hail from the New York City metro area, a site of racialized economic tension with the rest of the state, evidenced by campaigns such as Indeed, Binghamton’s student body is (Vestal, where the university is located, is 88% white), and even though the relatively low-cost public university–approximately eight thousand dollars a year for in-state tuition– serves many first-generation college students, students with generous financial aid packages, and students employed while matriculating, the city’s poverty amplifies even slight class privilege. The campus, 12,000 undergraduate students strong, often seems remote from the city I just described. Only 6% of BU students are drawn from its surrouding Broome County. The vast majority (60%) of BU’s students hail from the New York City metro area, a site of racialized economic tension with the rest of the state, evidenced by campaigns such as “Unshackle Upstate.” Indeed, Binghamton’s student body is more racially diverse than Binghamton the city (Vestal, where the university is located, is 88% white), and even though the relatively low-cost public university–approximately eight thousand dollars a year for in-state tuition– serves many first-generation college students, students with generous financial aid packages, and students employed while matriculating, the city’s poverty amplifies even slight class privilege. These long-term structural fissures have led to tensions between the university students—whom some Binghamtonians problematically peg as wealthy outsiders and/or racially target—and full-time residents, dubbed “Townies” by many students and dehumanized as the backdrop to their college experience. While students and year-round residents inhabit the same physical spaces in Binghamton, they are not in fact living the same place and they often experience, interpret, and act on the same auditory information in drastically different ways. Binghamton sounds differently to each group, in terms of the impressions and interpretations of various auditory phenomena as well as the order of importance an individual gives to simultaneous sounds at any given moment. Embodied aural perceptions shaped by class, race, age, and differing regional experience may in fact drive many of the “town and gown” conflicts—noise complaints most obviously—and exacerbate others, particularly mutually distorted perceptions that students bring Binghamton down and that residents are, as one student cruelly stated in the campus newspaper, “creatures” from “an endless horror movie.” So how to address this divide? And how to use sound studies to do it? I knew I did not want to impose a community project on my students that did not have their buy in and creative energy behind it. I decided on a group-sourcing project that asked students to work together to design a sound-studies based community project. I envisioned the assignment as the first phase of a longer-term project, with the most workable idea serving as the basis for a full-blown service learning experience in future courses. However, the assignment proved to be pedagogically valuable in its own right, not just as a prelude to future work. The relationship between sound and time was very useful to our project; we understood the concept that no city ever sounds the same after a long period of time, and we sought to take advantage of this fact. Through our residents’ stories, we learned that Binghamton was once booming with sound from numerous, lucrative industries. Walking into a factory brought an industrial cacophony: card punchers thudded as steel was pounded against steel. However, today, a walk into these factories results in an eerie silence. We wanted our soundwalk participants to realize and become affected by this lack of and difference in sound, and raise pertinent questions: what happened to these sounds? Why is there such a large difference in sound levels? Where do I place myself within this soundscape? I worked with Binghamton’s Center for Civic Engagement—a model program founded in 2010—and in particular with Assistant Director Christie Zwahlen, to equip students with basic-but-solid knowledge that would enable a new understanding of community work. Zwahlen brought home two major principles to students: 1) service learning has a pedagogical component; it is important to a project’s success that students learn something through their work rather than merely donating time or skills, 2) Community engagement works best when based on identifying and mobilizing a community’s assets rather than implementing an external project addressing perceived deficits. These two concepts meshed especially well with the students’ evolving understanding of listening as multifaceted, political, and deeply impacted by temporal and spatial contexts, because it required the students to engage directly with community members and learn how to listen to their voices, histories, and needs. For both civic engagement and sound studies, Zwahlen and I introduced students to the various methods used to solve problems and answer our most important questions. For civic engagement, Christie focused on the asset map, which forced students to think of the surrounding community in terms of its strengths rather than the weaknesses they could already readily list. This exercise not only flipped their perspective but also helped them imagine and hone their project by identifying community stakeholders who would be receptive to their inquiries. Initially, solving a community issue through sound seemed next to impossible. It wasn’t until sitting down and thinking about the sound studies methods of soundwalks that it became clear. I liked soundwalks because they are a way to engage anyone in sound studies. They are an easy concept to explain to people who may not have thought much about their soundscape previously. They are an active and fun way to engage all community members in listening well. As Lundeen relates, interweaving these methods formed the foundation of their community projects, enabling their inquiries regarding understanding differences in listening, how to enable people to recognize and discuss aspects of their listening, and to provoke some kind of impactful social change. prepared personal reflections on the process. Restoring the Pride: A public art initiative building rain-activated sound sculptures. BUCS: Binghamton Unites Community with Sound: A public group karaoke project. Safe and Sound: A “kiosk walk” of 10-interactive electronic sound art pieces that increase downtown destination traffic by day and operate as a “blue light” safety system by night. Blues on the Bridge Junior: A children’s music stage at one of Binghamton’s most popular yearly events. Happy Hour: A weekly campus radio show designed to combat seasonal depression. Listen Up! : Sound Month Binghamton: An annual themed digital “sound collection month” in March with accompanying “sounds of Binghamton” remix project. This project fosters community habituation to “Others’” sounds while also tracking long-term changes in the soundcape and in residents’ ideas of noise. A Sound Walk Through Binghamton: Historical soundwalks through several areas in Binghamton, where archival sounds of the past (some compiled from recordings, some performed) are placed in continuity and contrast with contemporary soundscapes. Zwahlen and I understand that this iteration of the project does not constitute civic engagement as of yet. Certainly, the students raised more questions than solutions: how to work with—and equitably solicit contributions from—community members rather than organize classroom-first? How to increase community involvement on a campus that is a foreboding maze at best—and how to increase student traffic in the many sites not reached by Binghamton’s limited public transportation? Most importantly, How to share sound studies epistemology beyond the classroom, creating listening experiences that not only take differences into account but potentially re-script them? As we move forward with long-term development, we will undoubtedly encounter more questions. However, even at its earliest stages, I believe guiding my students to integrate sound studies methodologies with asset-based service learning provided them with a transformative experience concerning the powerful resonance of applied knowledge and sparked the kind of self-realization that leads to civically engaged citizens. It created meaningful connections between them and a local community suddenly made significantly larger. For my students, listening became more than a metaphor or an individualized act of attention, rather they began to understand its role as a material conduit of location, outreach, and connection. As an anonymous student shared in my teaching evaluations: “This class was different, but in a very good way. It has been so involved with the human experience, more so than with other classes.” In the middle of the so-called “humanities crisis,” this response points to the potential power of a civically engaged sound studies, a branch of the field combining research with praxis to reveal the role of listening in the building, maintenance, and daily experiences of diverse communities in the city spaces they mutually inhabit but often do not fully and equitably share. Jennifer Stoever is co-founder and Editor-in-Chief of Sounding Out! She is also Associate Professor of English at Binghamton University and a recipient of the 2014 SUNY Chancellor’s Award in Teaching.